Thanksgiving in Tennessee was an absolute ball. Milton, of course, had the most fun out of the three of us. Our doodle loves to socialize with anyone who will give him a little pat on the head or a good belly rub. Everyday Milton made the rounds of the multitudes at our celebration: adults (15), other dogs (8! ), and especially little children (7) who are just on eye level with him. The Milt gave out quite a few licks to kids, inducing some tears, but, on the whole, he received a warm reception from everyone! The Milt always tries to make himself at home wherever he goes. The hospitality we received from Jeff's family was wonderful. It is always a shock returning home because the three of us in our apartment just can't reach the same level of excitement as a houseful. Milton certainly tries his best, though, to keep us always entertained! 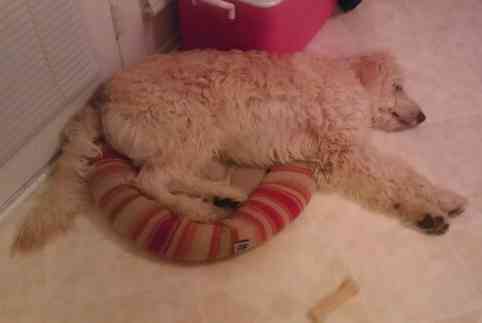 So lemme guess.......not his bed. Glad to hear that you guys had a good time! Milton is so cute when he's ready to call it a day! Our Little Boy's All Grown Up!